Mike and I haven’t decided which room to give the baby. We don’t know too much about what we want to do with the room yet (though I feel like I’m getting closer, maybe I’ll share some inspiration next week). But today, I spotted something and I had to have it. Okay I spotted two things and I had to have them. While reading one of my usual daily reads, Centsational Girl, I stumbled upon this inspiration image. This image was included in the post at Centsational Girl because of the painted dresser. 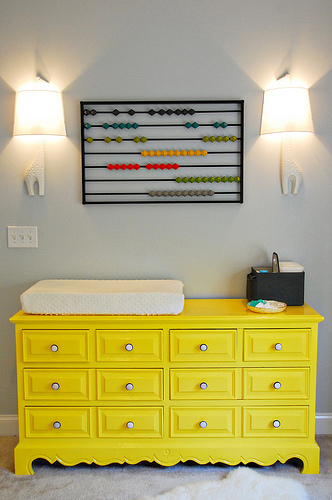 I most definitely want a bold painted dresser to use as a changing table, but that’s not what caught my eye. The abacus (from CB2) is also insanely awesome, but that’s not what I had to have right now. Okay have you figured it out yet? 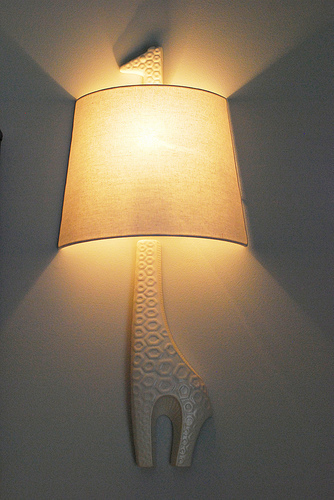 Yes, the giraffe sconces! You’re probably wondering why I cared about this. Well, Mike and I are gift card hoarders. I mentioned the other day that we’re hoping to carpet our office with a Home Depot gift card we have hanging around. We just so happen to have a bunch of money remaining on some Macy’s gift cards from… our wedding. Mike also has received rewards at his job that he gets in the form of credit to a gift card mall, so he redeemed some for Macy’s gift cards. We’ve been waiting to use to our Macy’s cards on a major purchase that we really wanted rather than just use them for odds and ends. 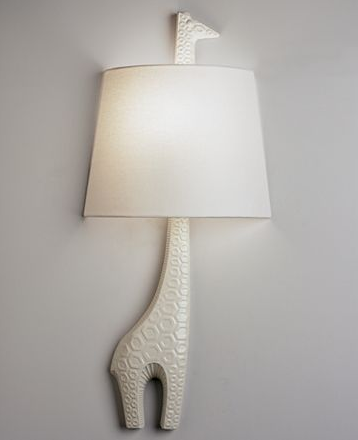 They were a little bit more on the Macy’s site, $167, but still less than the $195 listed on the Jonathan Adler site. I was able to use the Veteran’s Day code advertised to save another $30 and received free shipping. Then I used my gift cards and paid a total of… ::drumroll::: $50.96. That’s such a cute light, and you did get a great score! Love it! OMG its a steal! =) a splurge… but a steal!!! LOVE them! I love it already!! Your taste reminds me of mine with Amelie’s nursery. You should come see it one day. They’re so cute! So glad you were able to buy them. ohmygosh, I saw that picture yesterday (because of Sherry’s interview) and was obsessed too! especially with the abacus, but those giraffe scones are to die for too! Cuteness! And good for you guys for splurging! The giraffes will be a detail that EVERYONE notices!